To Get Massive Biceps – Read This! 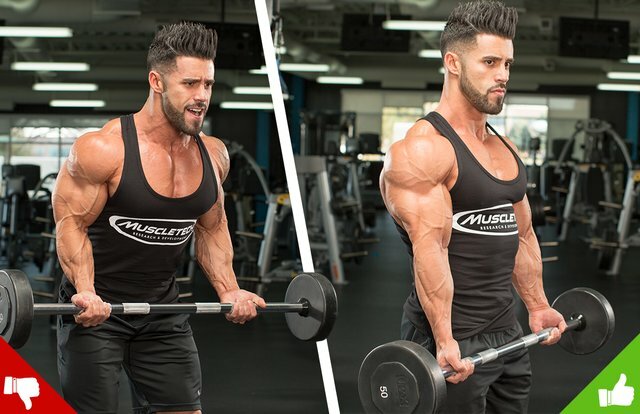 4 Barbell Curl Mistakes – And How To Fix Them! As with virtually any muscle building program, you want to optimize your body so it has the absolute best chance to grow new muscle…and that’s why we highly recommend using the high quality, all natural and healthy muscle building products from Gold Medal Supplements. Take a look to see just how much more muscle mass you will be able to grow using them! Everyone wants big arms. But if you’re making any of these easily avoidable blunders, it’s off to the gallows for your workout plan! There are any number of biceps curls for building big arms, each of which has its pluses and minuses. But if you had to pronounce the one true King of the Curls, it would surely be His Majesty, the standing barbell curl. Yes, a possible contender for the throne might be the chin-up, which, though common, provides a rare and regal multijoint arm-flexor movement. But compared to the standing version of the barbell curl, with its superior overall arm stimulation (as measured by EMG activity) and its ability to overload the muscle group with noble amounts of weight, the chin-up must bow before its lord and master. Alas, things can go awry when it comes to executing a standing barbell curl. 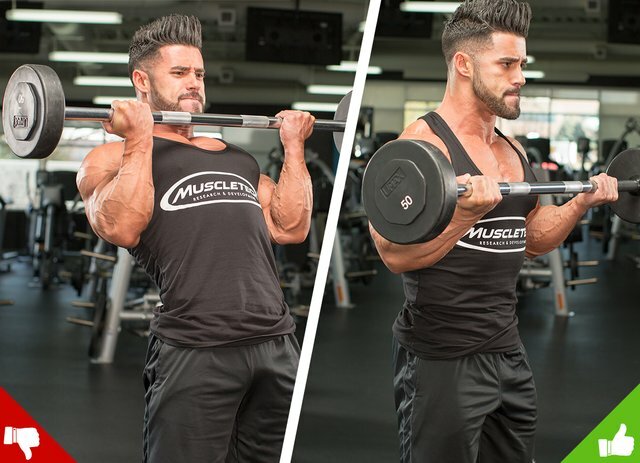 Here are the top four mistakes in form that can send your biceps workout to the dungeon. Ever noticed that you’re stronger when you do a curl standing instead of sitting down? Is it because you feel like a mighty warrior standing on your own two feet? Maybe. But it’s more likely because you’re using your knees and hips to generate a little body English. Momentum can help you overcome a sticking point in the curl, which for most of us is about halfway up the range of motion (ROM). But using other muscle groups to get that barbell up top means you’re taking some of the workload off your biceps. You need to stop the rocking to get a true standing version of the curl. You’ll also protect your lower back from bad-form-induced injury. Plus, if you use a weight you can’t lift with good form on the very first rep, you’re turning a single-joint exercise into a multijoint movement, which reduces the stimulus on the biceps. If your biceps can’t handle the entire load for even one rep, you’re forcing your lower back and legs to make up the difference. Having said all that, if you can bang out 6-7 clean reps on your own, then it’s okay to do just one or two cheat reps (maybe just a bit of hip thrust) to keep the set going. Just keep the degree of body swinging to a minimum so you can push past failure without overloading your spine. One way some people try to impress the folks at the gym is by putting a whole lotta weight on the bar, but then cheating on the eccentric portion of the curl. Instead of fully extending their arms all the way down at their sides, they extend them partway and lean forward. It looks like they’re lowering the bar…but they aren’t. When this technique is done intentionally, it’s called partial-rep training. But when you’re trying to push too much weight on a standing curl, it’s a cheat. Training through the full ROM strengthens your muscles more completely. If you can, watch your form in the mirror to make sure you’re fully extending your arms. You may have heard that when you do curls, it’s best to “raise the bar as high as possible.” Not so much. The correct guide? Bring the bar as high as possible—so long as your elbows remain by your sides. The basic curl should be done with your elbows pinned by your sides: There should be no other movement than your forearms going up and down. In trying to raise the barbell higher, many lifters push their elbows forward (consciously or not). 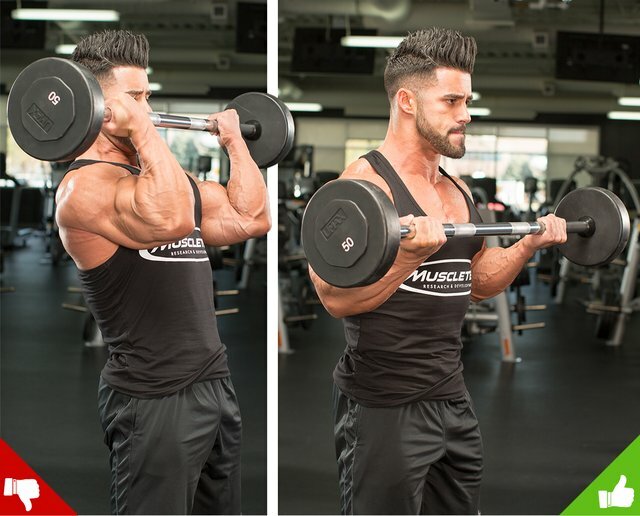 This brings the front delts into the act, which reduces the work your biceps have to do. And by putting your arms into a position where your hands are stacked over your elbows, “raising the bar as high as possible” reduces the tension on your biceps to create an unwanted resting spot (aka another cheat). What’s the prime real estate when it comes to your body-part routine? That would be the movement you do first, when your energy levels are highest and you can push the most weight. 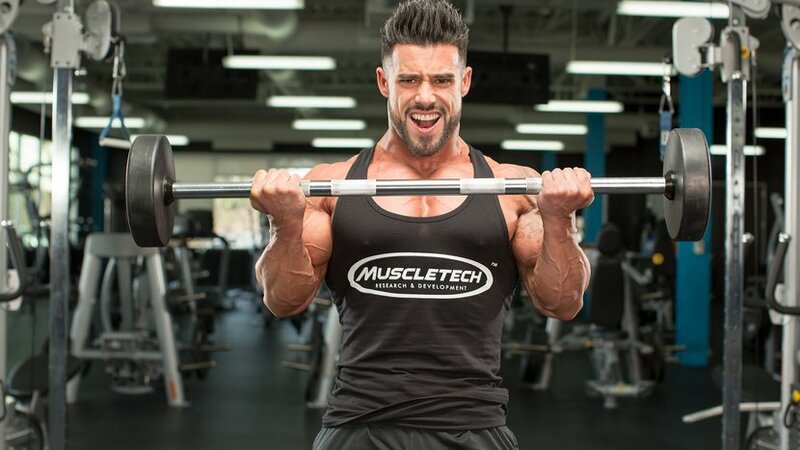 Doing your standing curls first allows you to emphasize both mechanical tension and muscle teardown, both of which are necessary for muscle growth. Don’t be afraid to start out by choosing a heavier weight and training at the lower end of the hypertrophy rep range (about 6-8 reps) when your strength is high. These lower reps get you a slightly better strength-and-size stimulus than if you opted for less weight and 10 reps.
Once you reach the end of your workout, do concentration curls or other seated exercises. These seated moves are much more isolated, so it’s harder to cheat on them. And since people tend to use less weight on seated moves than on standing moves, it makes sense to do them at the end when you’re more fatigued. So there you have it: The standing version of the barbell curl, when done correctly, is indeed the King of the Curls. 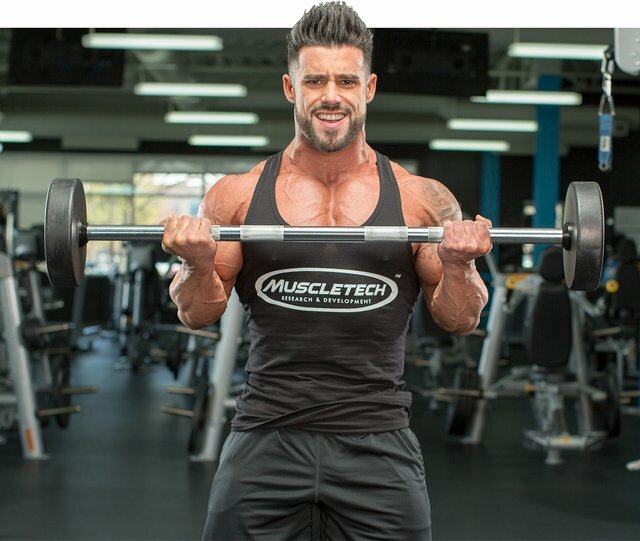 5 Serious Muscle Mass Programs! How To Build Awesome Shoulders! How To Lose Weight As Fast As Possible! Liver Detoxification — Fact or Fad? Natural Anabolics: 8 Powerful, Safe Alternatives to Steroids! What’s the best supplement for building muscle size? Do This Today, Fast, Right Now, Works Quickly, Step-By-Step, Easy, Quick, Simple Fitness and Health Coaching!